This skilful conversion of a Grade II listed Suffolk barn includes central heating to radiators, Wi-Fi connection and underfloor heating for added enjoyment of this centuries-old building. Woodside Barn accommodates six in three double-bedrooms, plus a baby cot. Each bedroom has its own shower room. One bedroom is downstairs and has wetroom facilities, complete with mobile shower chair if required, so is suitable for those with particular needs. In addition, the Crow Room can easily be converted to a double bedroom, with its own shower room. 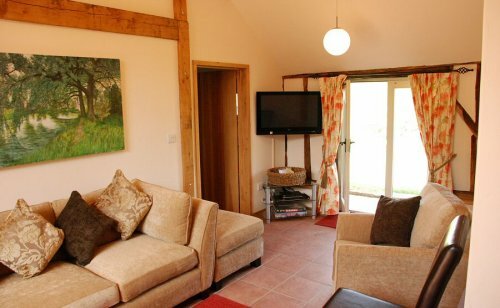 The Barn conversion was completed in 2009 and is now thoughtfully furnished with quality pieces and flair throughout, designed for visitors to thoroughly enjoy their stay. Central to the Barn is the double-height and comfortable living space where you can talk, dine, and relax, in the calm atmosphere of a room which is open from floor to roof and is light and airy. Locally there are public footpaths to explore, Friston's interesting village church to visit and the village green too with the old windmill as its backdrop. Take a look at our Where To Go page to know more about the location of Friston and the attractions of this area of Suffolk. Designed and supported by Blythweb Ltd 2010 – 2015.